They say it is spring in Indiana, but it was 20 degrees this morning. We have been having some very nice weather the last 3 weeks though, so I certainly am not complaining because it is Spring in my house. 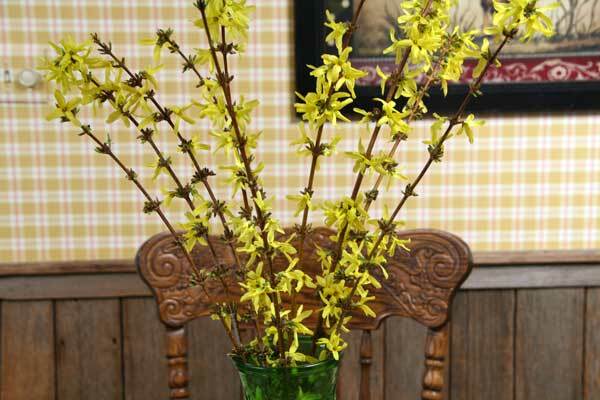 Last weekend Jon cut off some stems of my Forsythia bush and I put them in some water and forced bloomed them. I now have the prettiest bouquet on my kitchen table. I have enjoyed my spring flowers so much and it certainly lifts my spirits on a cold morning. The flowers have lasted all week too. Tomorrow I am cutting off more stems for Mom and for myself for another week of enjoyment. Jon is trimming the apple trees tomorrow, so I am going to see if I can get Apple Blossoms to bloom. Does anyone know if this works? I love pretty placemats and napkins. Jon got these for me for Christmas. Aren't they beautiful? I wish my photography was as beautiful as my flowers. I am redecorating and I thought you might enjoy seeing what I have been doing. I still have to find a word for under the clock. I would like to find the word BLESSED, so I need to go shopping. 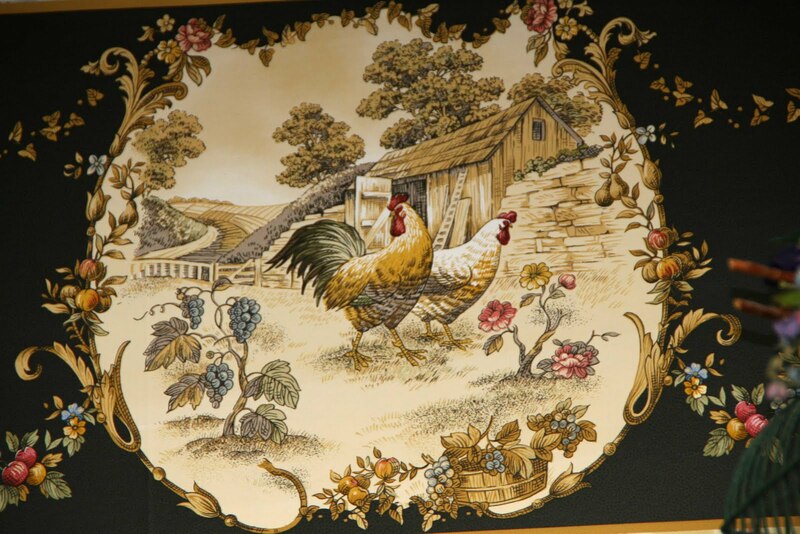 I absolutely love my new Rooster picture and it goes so nice with my new wallpaper border. 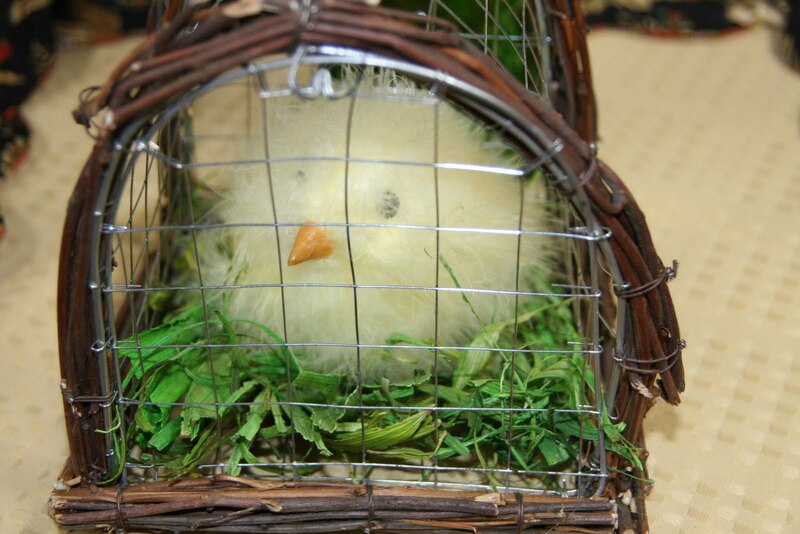 Isn't this the cutest little chicken you have ever seen? I found it last week at my favorite decorating shop, and I just couldn't resist. Every time I wall by him, I think he will peep. This is my new wall paper border. 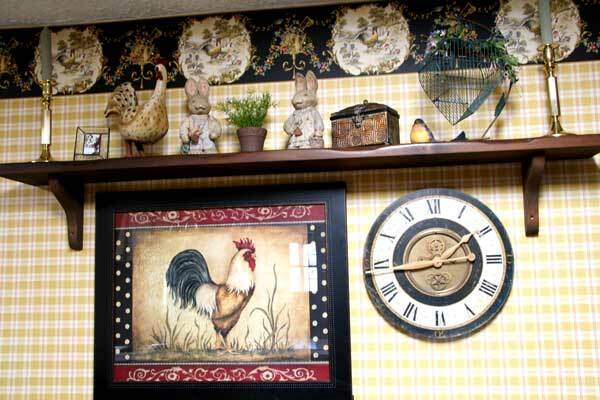 We have a big old farm house and it looks perfect in my kitchen. Our new counter top, sink and stove have to be installed yet, but I already love my new kitchen. Everything looks so lovely Joan, I'm thrilled for you! 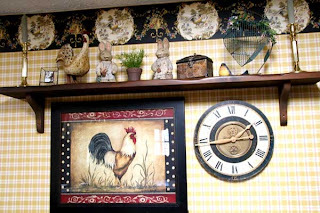 Love your wallpaper, so perfect for a farmhouse! Thanks for sharing, I've been waiting to these! Love it, Joan! 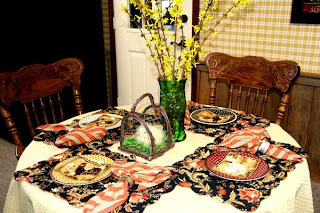 Wish I could pop on over for a cup of coffee at that beautifully set table -- and while we're at it -- how about some home made pie, too!!! A girl can dream!!! The paper border is LOVELY!!!! Oh my, so appropriate for your home!!! Glad you are getting things done!!! FANTASTIC my friend!! Your border is JUST PERFECT and the wall grouping is so "you"!! I can't wait to see it when I come to visit!! It sure seems to be coming together the way you had envisioned!! WooHoo!! Your little chicken looks so cute and so REAL!! Joan, you can cut the word blessed on your Cricut out of vinyl. Your kitchen looks great!